Home » Widow vs. Widower – What’s the Difference? It’s a sobering thought, but tragedy can strike any of us at any time. Death is a natural part of life, and one day, all of us will die. Perhaps, someday, advances in modern medicine will allow humanity to achieve the far-off goal of immortality, but today is not that day. Today, we need words to describe people whose spouses have died. The words widow and widower describe such people. Which is which? Continue reading to learn more. What is the Difference Between Widow and Widower? 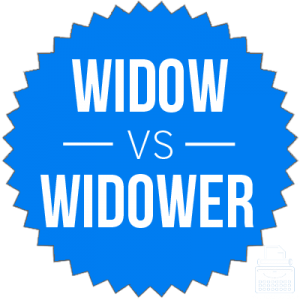 In this post, I will compare widower vs. widow. I will use each word in several example sentences to give you an idea of how they should look in context. I will also use a helpful memory tool to show you how to choose widower or widow each time you need to use one of these words. What does widow mean? A widow is a woman whose spouse has died. Additionally, this woman has not remarried. One she remarries, she stops being a widow. Wars produce many widows, and a black widow is a species of spider whose females eat males after mating with them. A widow can be any age; the defining factor is that a widow’s spouse has died. Whether this unfortunate event occurs at age 20 or age 80 doesn’t matter. The dead person’s gender is also irrelevant, as long as the surviving spouse is a woman. The type of death also does not matter—a woman who poisons her husband to death is as much a widow as a woman whose husband asphyxiates while pulling orphaned children from a burning building. The sentences below are examples of widow in context. Since becoming a widow, Marla rarely comes outside the house except to attend church. A wealthy widow would make an advantageous wife for an eligible new-money bachelor. What does widower mean? A widower, in contrast, is a man whose spouse has died. Again, once the man remarries, he is no longer a widower. Also, as is the case with widow, the age and cause or death are irrelevant. Poor Jacob married his high school sweetheart right after graduation, and is already a widower. Max has done well for himself as a young widower, and has been photographed around town with a cavalcade of popular starlets. Remember widow vs. widower is simple. A widow is a woman. A widower is a man. Since widower and bachelor both describe single men and both end in R, remembering the difference between these words is almost as simple as the difference itself. Is it widow or windower? A widow is a woman whose spouse has died. A widower, on the other hand, is a man whose spouse has died. If either of these poor individuals remarry, they are no longer widows or widowers. 1 What is the Difference Between Widow and Widower?